Smart speakers have become a common sight. Many homes now contain at least one of these Jetsonian, voice-command devices, whether it’s an Amazon Echo, Google Home, or a lesser-known model. And this development has certainly not been lost on retailers and brands. Companies ranging from Walmart to Domino’s, P&G to Mondelez are presently grappling for superior positioning vis-à-vis this, some would argue, emerging channel. But for all the hoopla, just how common is shopping via smart speaker—I mean, really? Has v-commerce, as in voice-command commerce, reached a critical mass yet? To answer this question and others, Field Agent recently surveyed 520 bona fide, U.S.-based smart speaker owners. To verify smart-speaker ownership, each participant was required to submit a photo of his or her in-home smart speaker, as the sample photos demonstrate. Amazon Echo dominated the survey. Some 74% of respondents owned an Echo in one form or another (Dot: 40%, standard Echo: 27%, Show: 3%, Plus: 2%, Tap: 1%, Spot: 1%), while 22% reported ownership of a Google Home (Mini: 14%, standard: 8%). All other brands fought for the leftovers—a meager 4%. 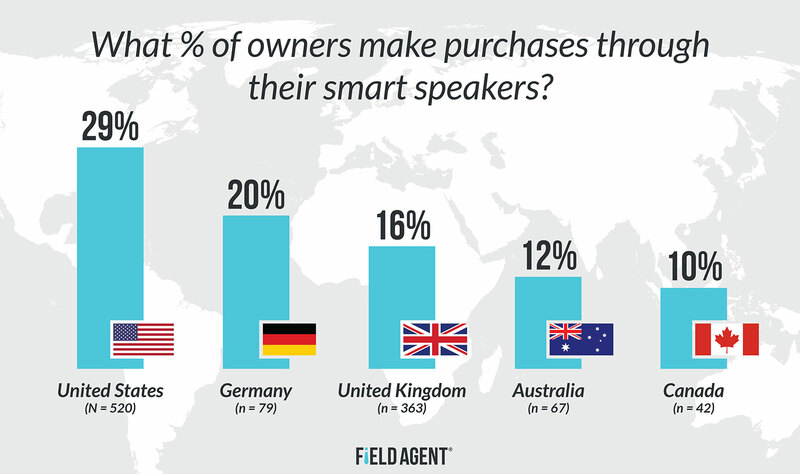 With operations in eight countries and growing, Field Agent also took the occasion to survey 2,735 shoppers across four major international markets about their smart-speaker ownership and usage. Below we present several timely insights about shopping via smart speaker. Of 520 U.S.-based owners, only 29% said they actually make purchases through their smart speakers. Still, as you can see from the graph, the proportion of U.S. smart speaker owners making purchases is probably higher than other major markets. In our survey of shoppers across Australia, Canada, Germany, and the United Kingdom, no market demonstrated an ownership-to-purchase ratio greater than 20%. Not surprisingly, among U.S.-based owners who make purchases through their smart speakers (n = 149), music is easily the top purchase. But besides digital music, it’s trash bags, toilet paper, detergent, and other non-durable, household supplies (35%) that smart speaker owners are most prone to purchase by voice command. This is understandable, since household supplies aren’t exactly “shopping” goods. They require little to no price comparison or brand consideration, and they can be easily reordered through a smart speaker. With its Echo devices, Amazon effectively created the shopping-by-smart-speaker channel. It's therefore not unexpected that Amazon would be the most popular retailer for making purchases through a smart speaker. Of U.S.-based owners who make purchases via their smart speakers (n = 149), a heaping 81% reported making such purchases through Amazon. That’s 65 points ahead of second place Walmart (16%) and its alliance with Google Home. Of course, it should again be stressed that the sample consisted predominantly of Echo owners, perhaps reflecting smart speaker ownership in general. Domino’s (15%) and Best Buy (9%) fared relatively well in the survey, in third and fourth places respectively. Then there are those who own a smart speaker but don’t make purchases through it (n = 371). As is common with most emerging retail channels, non-use is the major reason for non-use. In this case, 50% say they simply haven’t tried purchasing anything via smart speaker before, and another 42% say they’re satisfied with their current shopping methods. For instance, 39% of respondents said they don’t shop through their smart speakers because they can’t easily compare prices, while 35% simply want to view products before purchasing them. Likewise, 23% say they’re concerned about unauthorized purchases by kids or others, and another 21% have security concerns about shopping by smart speaker (e.g., safeguarding financial information). Of course, purchases via smart speaker assume different forms—namely, (1) shopping purchases and (2) reorders/refills. The former feasibly require more effort on the shopper’s part: comparing prices, considering brands, researching reviews, etc. Conversely, reorders/refills are simply repeats of previous purchases. In our survey, 14% said they use their smart speakers to reorder/refill past purchases (i.e., already in their purchase history) and 8% reported shopping for products not previously bought online. So we asked this small but important subset of shoppers (n = 44) whether it’s generally easy or difficult to shop through their smart speakers (i.e., for products not already in their online purchase history). Sixty-eight percent agreed it’s relatively easy to do so, while only 11% say it’s difficult. We asked this same subset (n = 44) to tell us under what circumstances they shop for products by voice command. 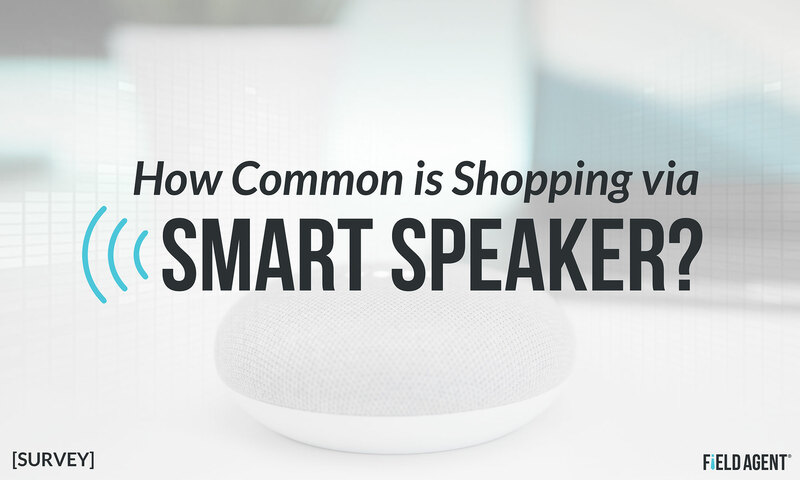 Sixty-four percent said they shop via smart speaker when they know exactly what they want, while 57% said they do so when they’re shopping for really simple items. Another prominent contextual factor: sales and discounts. Fifty-seven percent reported shopping via smart speaker when there’s a price promotion to take advantage of. The smart speaker is also a chance for CPG brands, it seems, to interact with customers and potential customers. After all, many popular household brands, from Betty Crocker to LEGO, have developed skills or apps to communicate with customers and promote their products. Are they gaining traction with smart speaker owners? 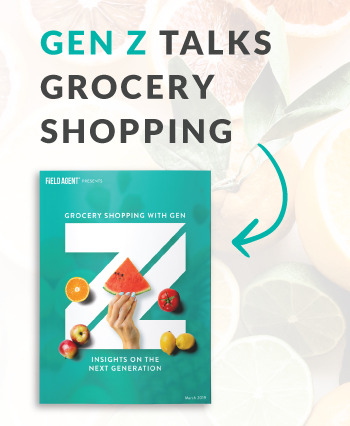 Of 520 owners, 90% said they’ve never interacted with a CPG brand via their smart speaker. Tide was the most commonly cited “branded” skill/app used by smart speaker owners. Six percent said they’ve interacted with the detergent brand through their devices, with Glad trash bags (5%), Campbell’s soup (2%), Quaker Oats (2%), and Ritz Crackers rounding out the top five. Smart speakers are not currently a prevalent means by which shoppers make purchases…and they won't be any time soon. The real potential of the smart speaker, as a retail channel, has been exaggerated. Smart speakers are not currently a prevalent means by which shoppers make purchases…but, like many product diffusions and retail innovations, it simply takes time to change shopping routines. The real potential of the smart speaker, as a retail channel, has not yet been realized. Which is right? Time will tell, of course. But whichever view you subscribe to, shopping via smart speaker has a ways to go. Best of all, the report is free.